In less than 15 seconds, the Commercial Electric Easy Light turns a plain lamp holder into an energy efficient LED flush-mount fixture. Without doing any wiring, you can replace bare bulbs in basements, garages, and other areas with high quality LED lighting. The Easy Light operates with a pull chain or from a switch and also comes with a hardwire installation kit, so it can be directly wired to a junction box, if desired. It is cUL rated for use in damp locations and ADA compliant. 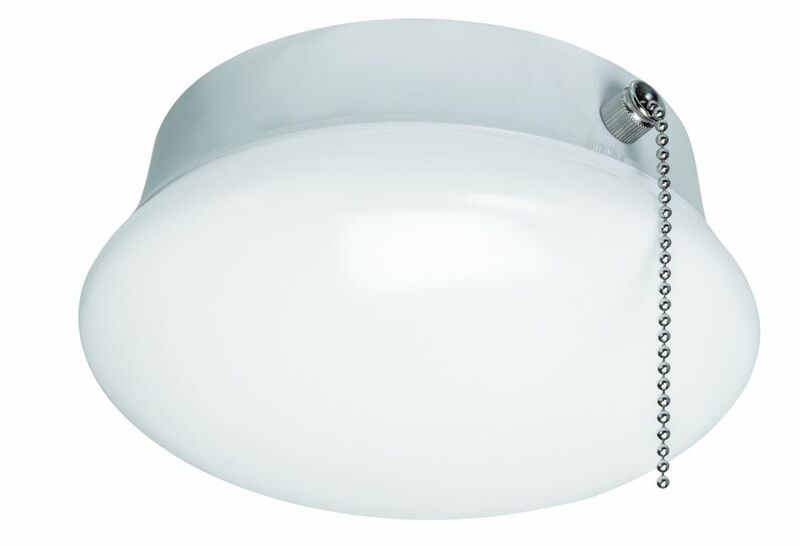 7-inch Integrated LED Flushmount Ceiling Light Fixture in White - ENERGY STAR® In less than 15 seconds, the Commercial Electric Easy Light turns a plain lamp holder into an energy efficient LED flush-mount fixture. Without doing any wiring, you can replace bare bulbs in basements, garages, and other areas with high quality LED lighting. The Easy Light operates with a pull chain or from a switch and also comes with a hardwire installation kit, so it can be directly wired to a junction box, if desired. It is cUL rated for use in damp locations and ADA compliant. 7-inch Integrated LED Flushmount Ceiling Light Fixture in White - ENERGY STAR® is rated 2.0 out of 5 by 4. Rated 1 out of 5 by Steve from Lights fail after limited use We bought the 9 of the U.S. equivalent (SKU 1000036809 - no pull chain) They are installed in our basement which is used for less than 5 minutes daily. 2 of the 9 have now died completely after about 14 months. The warranty is 5 years and we're seeing about getting them replaced. They're a great idea but the quality appears to not be in line with their warranty. Rated 1 out of 5 by Kang from out of order after only 1 year I ought 4 of these and installed on my garage a year ago. And one of these out. I checked this item at homedrpot display shelves, and it says 5 year, 5000 hour life. I have installed sensor switch in my garage, so the light won't be on 5 minutes. each time. The one year usage could be 50-100 hours and way lower than 5000 hours use. Rated 1 out of 5 by Nick Name from Dead in 6 months Description says the fixture lasts 45.6 years when it fact it lasted less than 0.6 years. How do you download the manual as there is no option to save when it opens in .pdf?